Betty White's incredible role continued with an Outstanding Guest Actress in a Comedy Series Emmy win for her appearance on "Saturday Night Live." What made the moment truly remarkable was that they failed to put the woman on stage. White of course got the "SNL" hosting gig because a Snickers commercial she made so delighted some fans that they launched an "Get Betty White to Host SNL" campaign on Facebook. Eventually the Betty White Thing got so much momentum that she was cast to star on TV Land's first sitcom, "Hot in Cleveland." And of course the producers of tonight's show included Betty White in the "Born to Run" opening number, during which "Mad Men" star Jon Hamm "backed that up on her," if you know what we mean. And then the two presented an award together -- too long ago, who can remember? -- at which time White quipped about their "sexual chemistry back in the quick-change room." But the woman wins a prize and nothing. Go figure. 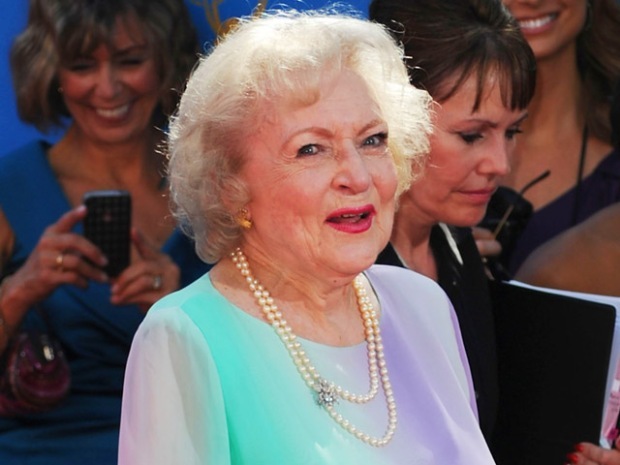 The nation's sweetheart, Betty White, arrives at the Emmys.